The Diviners in a single word: atmospheric. Although this book is ostensibly about a serial killer and a group of teenagers with supernatural talents, it’s really about the 1920s, more specifically, the Roaring Twenties in New York City, USA. The Diviners doesn’t exist outside of this setting; or maybe it would, but it would be a much different and greatly inferior story because of it. The time period becomes a character itself in this novel, and the primary conflict of the story—the efforts of a hip, young group of supernatural detectives to apprehend an ancient killer called Naughty John—can actually be reduced to a historical conflict marking this era, the dissonance between progress and tradition. Naughty John, and many people in this period, view the future as a forbidding place full of sin while our heroine Evie and her teenaged friends embrace the prospect of limitless progress. Masterfully, Bray refuses to favor one side of this conflict over the other. While the old-fashioned ways supported by Naughty John are clearly incorrect, the progress heralded by the youth is wrong as well, as evinced by Bray’s inclusion of a eugenics movement side plot. Bray perfectly juxtaposes these two belief systems and captures the mood marking their division. I wholeheartedly recommend this book for its exploration of the aforementioned theme, but there are still a few flaws, mostly flaws of excess. There are too many characters, all of them terribly interesting, but besides Evie, I never knew whose story this was. It jumped around, and when it seemed that Bray would finally unite her characters, it was a false alarm. Bray was such a tease in a way, introducing a character with an intriguing backstory and then never discussing him or her again. Bray’s other crime of gratuitousness is the length of this tome. It’s LONG, much too LONG. In particular, as I neared the end, all I wanted was a climax. Finally, hark a climax appears! but then I had to suffer through interminable pages of denouement. I would’ve appreciated a good curtailing; there are a ton of ideas and characters and mythologies crammed in this book, and at times, it was simply too much. Despite these flaws, I’m totally invested in this world and cannot wait for the sequel. Even though I know I’ll forget many of the finer plot details and minor characters, this read will persist for a while because of the general feeling it evoked in me. 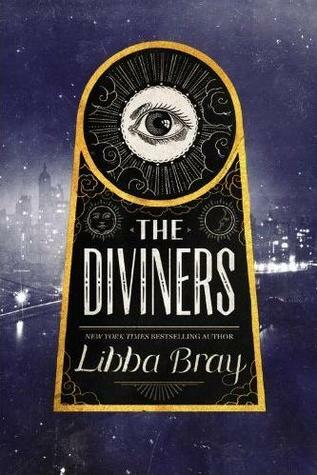 Featuring both gorgeous, authentic language—which many reviewers complained of being over-the-top but I found perfectly suitable; where else could I learn the slang term “elephant’s eyebrows”?—and the glamorous ambience of this historical era, The Diviners, in a somewhat oxymoronic fashion, both romanticizes and realistically represents New York City in the Roaring Twenties. Readalikes: The nonfiction novel The Devil in the White City: Murder, Magic, and Madness at the Fair that Changed America, which examines the work of a serial killer during the 1893 World’s Fair in Chicago. Creepy and cool, it captures the same discordance between tradition and progress. 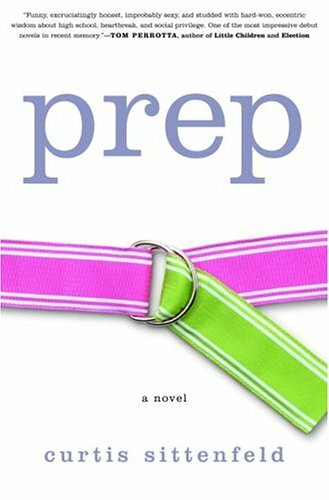 Curtis Sittenfeld’s debut novel, Prep, is an insightful, achingly funny coming-of-age story as well as a brilliant dissection of class, race, and gender in a hothouse of adolescent angst and ambition. Lee Fiora is an intelligent, observant fourteen-year-old when her father drops her off in front of her dorm at the prestigious Ault School in Massachusetts. She leaves her animated, affectionate family in South Bend, Indiana, at least in part because of the boarding school’s glossy brochure, in which boys in sweaters chat in front of old brick buildings, girls in kilts hold lacrosse sticks on pristinely mown athletic fields, and everyone sings hymns in chapel. As Lee soon learns, Ault is a cloistered world of jaded, attractive teenagers who spend summers on Nantucket and speak in their own clever shorthand. Both intimidated and fascinated by her classmates, Lee becomes a shrewd observer of–and, ultimately, a participant in–their rituals and mores. As a scholarship student, she constantly feels like an outsider and is both drawn to and repelled by other loners. By the time she’s a senior, Lee has created a hard-won place for herself at Ault. But when her behavior takes a self-destructive and highly public turn, her carefully crafted identity within the community is shattered. Ultimately, Lee’s experiences–complicated relationships with teachers; intense friendships with other girls; an all-consuming preoccupation with a classmate who is less than a boyfriend and more than a crush; conflicts with her parents, from whom Lee feels increasingly distant, coalesce into a singular portrait of the painful and thrilling adolescence universal to us all. As I came to know more ex-boarding school students, her generalization gained credence. They were fully formed adults who behaved like they were in their late 20s. Meanwhile, the rest of us floundered about, worried about breaking dorm occupancy rules. After reading Prep I understand them better. I know how they came to be this way at the mere age of 18. In Prep Curtis Sittenfeld presents an authentic portrait of boarding school life that, for any sane parent at least, should serve as a massive flashing warning sign before sending any child away to school. Our protagonist Lee Fiora decides to apply to an East Coast boarding school in a fit of precociousness and derring-do at the age of 14. She leaves her parents and calm Midwestern existence for a more exciting life at Ault School. Again: at the age of 14. It goes horribly, of course. She must face the gender, race, and class discrimination that props up the ivy-covered brick façade of Ault. She navigates loneliness. She struggles to answer this question: do I want to change myself, peel away my me-ness in order to fit into this archaic institution or do I want to alienate myself from everyone by becoming a conscientious objector to this lifestyle? She narrates her four years at Ault after the fact as an adult, and it is clear that even after maturing outside this fishbowl, she has no good answer to this question. 1. This is not chick-lit, despite the title and pink belted cover. 2. It is an uncomfortable read. I always worried someone would notice me, and then when no one did, I felt lonely. Teenagers live in state of metamorphosis and high school is their chrysalis. Imagine if your chrysalis is inhabited by the spoiled offspring of Manhattanite bankers and national senators. Imagine if the floral pattern on your bedspread determines whether you are popular or not. Imagine that if you pine after a boy, you can never approach him; he will pursue, you will be pursued. Imagine if your chrysalis cannot be cracked open at the end of each school day when you return home; you must live among your peers in this extreme environment for four straight years. Actually stop imagining that because it’s horrifying. It’s obvious how such a life could ruin a mere child. How can you decide who you want to be in such conditions? I loved Sittenfeld’s largely plotless but wholly profound depiction of these conditions because it allowed me to vicariously live them without suffering their consequences. And after the melancholy final page, I was forcefully reminded me of three things: 1. we can only hope we have good parents 2. only by being rich, white, and male can you live your life effortlessly 3. boarding school will screw you up. Blurb: Mattie Gokey has a word for everything. She collects words, stores them up as a way of fending off the hard truths of her life, the truths that she can’t write down in stories. The fresh pain of her mother’s death. The burden of raising her sisters while her father struggles over his brokeback farm. The mad welter of feelings Mattie has for handsome but dull Royal Loomis, who says he wants to marry her. And the secret dreams that keep her going–visions of finishing high school, going to college in New York City, becoming a writer. Yet when the drowned body of a young woman turns up at the hotel where Mattie works, all her words are useless. But in the dead woman’s letters, Mattie again finds her voice, and a determination to live her own life. Set in 1906 against the backdrop of the murder that inspired Theodore Dreiser’s An American Tragedy, this coming-of-age novel effortlessly weaves romance, history, and a murder mystery into something moving, and real, and wholly original. 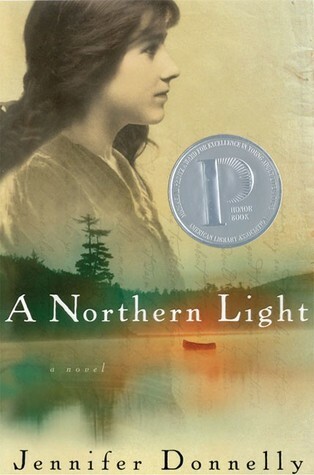 In A Northern Light author Jennifer Donnelly seemingly follows a recipe for an award-winning YA novel. Add one-part true crime, one-part coming of age, one-part romance. Mix in a clever but never kitschy framing device. And throw in a dash of racism and feminism. While these ingredients superficially bake together well, throughout the entire book a nagging feeling prevented me from declaring it a favorite and slapping it with 5 stars. A Northern Light is a case of a book that is almost too perfect, or at the very least, too ambitious. The world of Mattie Gokey, a young woman who collects words and loves to write but must help her father and sisters in the Northwoods of New York, is richly conceived. Imagining the resorts and farms in the Adirondacks inspired me to visit there one day and made me wish I could have visited there during Mattie’s time at the turn of the 20th century. In front of this beautiful backdrop, Donnelly shows the struggles of Mattie and all women to become learned and desert their traditional wifely and maternal duties. I appreciated Donnelly’s exploration of the question: why are so many famed female writers unmarried and childless when men can be successful while having a family life? Watching Mattie choose between her family and writing, a choice that shouldn’t have to be made, carries most of the narrative and provides excellent fodder for discussions of gender. This theme is supported elsewhere with the true crime aspect of the story, which unfolds very slowly. Although the mystery of the crime supplies the overarching narrative, in truth I found it to be rather disposable. What I most connected with, and the true strength of the novel, is the classic individual vs. society conflict. This conflict has always been my favorite because it is universal and defines my life. Mattie struggles to decide whether she should pursue what society wants for her (and what she may very well want herself) or pursue her dreams that require jumping into the abyss and abandoning her family and friends. As Mattie says, there is never any complete happy ending. A choice that may be happy for some will be devastating for others, and in seeing this conflict unfold, this impossibility becomes clear. While these positive factors should encourage anyone slightly interested to read A Northern Light, I still couldn’t rate it five stars. It is so ambitious and full that it seemingly follows a formula. As a result, I nearly always knew what was coming next. This foresight did not ruin my enjoyment, but returning to my overwrought recipe metaphor, the addition of a bit more spice would have made this novel into a perfectly delicious meal without any doubts. REDRUMCount ‘em: 1, 2, 3, 4—that’s 4 iconic images in The Shining that I will never forget. Normally if I finish a book and one image endures, that book is a success. But Stephen King is such a visceral writer. His prose itself is, well, prosaic. It’s weak, stuffed with clichés, and overly reliant on descriptive exposition. Where King succeeds is with images. He has a knack for memorable, hair-raising moments; it’s a shame that these moments only burst out occasionally from the surrounding excisable mediocrity. Yet that criticism holds true for all of King’s writing. His writing is passable; his ability to create A Moment extraordinary. My biggest criticism of The Shining in particular is how derivative it is. The Shining is essentially Stephen King’s retelling of Shirley Jackson’s masterful horror novel The Haunting of Hill House. And it’s not an altogether bad retelling. The problem is the source material is so incredible that King was bound to fail. In The Shining everything is straightforward. We know who these characters are, we know that they are being haunted, we know who is haunting them. It’s unambiguous and thus rather dull. In The Haunting of Hill House you finish the book knowing nothing. 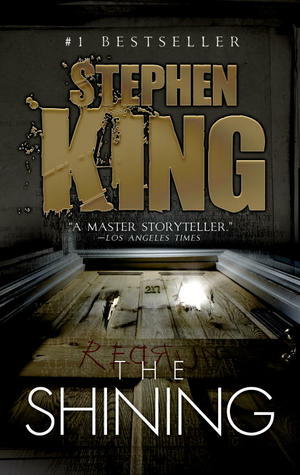 Indeed, it is a haunted house novel, yet you can’t even be sure that the house was haunted. The text merits rereading and deciphering and interpretations should vary from person to person. “if it [Overlook] played its cards right they [Jack and his family] could end up flitting through the Overlook’s halls like insubstantial shades in a Shirley Jackson novel, whatever walked in Hill House walked alone, but you wouldn’t be alone in the Overlook, oh no, there would be plenty of company here. That quote neatly summarizes my problem. We know exactly what’s happening at Overlook. A family of three falls into madness as the supernatural elements of the house take over. As a result, there’s not much interesting here besides, of course, the occasional superb image. The most interesting questions—Jack Torrance’s alcoholism and psychology, whether the hotel’s owners are aware of the problem, what happened to the previous hotel caretaker, why these dead guests are keen on haunting the Overlook: basically, how the hell did we get to this point of insanity?—are not only unanswered but essentially unexplored. Blurb: Cath is a Simon Snow fan. I pride myself on my cynicism. I pin it like a ribbon on the dark clothes I wear to broadcast my angst. 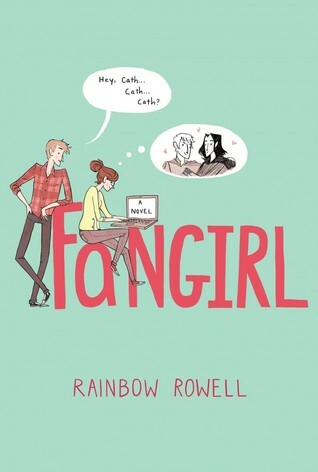 So when it comes to Rainbow Rowell I’m conflicted because she’s now written two books–Eleanor & Park and Fangirl–that make me want to dress myself ROYGBIV style while frolicking in a vat of kittens. That is not to say I will stop reading Rainbow Rowell books. Because: why? Why would I deprive myself of her perfectly gooey stories that never descend to shallowness and always leave me joyous? I guess I might just have to admit that for a few hours at least, when consuming a Rainbow Rowell book (consuming being the most apt descriptor: you do not read these books, you consume them like a cake topped with gobs of frosting and innumerable sprinkles), I am more sunshine than dark side of the moon. Yes, I am now an unabashed fan(girl) of Rainbow Rowell. While Eleanor & Park was an intense and internal tale of first love, Fangirl is a brighter, vaster tale of both first love and a bunch of things that happen when you “come of age.” Cath, a prolific fanfiction writer with social anxiety, goes to college and has to learn to navigate the real world instead of merely retreating to the safety of her fictional and internet-based world. It’s probably one of the better depictions of college—and I suppose also, young adultness—that I’ve read about. There’s drunkenness, roommate squabbling, empty nest syndrome, mental health problems, infuriating professors, dining hall conundrums, unintended makeouts, and family drama. These issues elevate the book above a standard romance. But let’s be real: I’m mostly here for the looooove and the fangirling. First, the fangirling. Cath doesn’t just write fanfiction; she writes Simon Snow fanfiction. In her fic, Simon (picture a scarless Harry Potter) and Baz (imagine Malfoy with a dash of Edward Cullen) are not the enemies they are in the canon series but gay lovers! It’s wildly popular of course. Throughout the book, excerpts from Cath’s fanfic and the “real” Simon Snow series precede chapters about Cath’s real life, often cannily mirroring what is happening to her. I have but one request: Rainbow Rowell, write a full version of Cath’s Carry On, Simon fanfic and post it to Fanfixx.net, please & thank you. I loved these stories, mostly how they goofily parody Harry Potter. The fangirl aspect itself will be appreciated by anyone who has loved something to the point of obsession. And now, the love story. The biggest complaint I can lodge against Ms. RR is her twee writing. Sometimes there are quotes that are cute, yes, but also demand an eyeroll. But I don’t much care because these twee statements are said by BFF-worthy characters. Cath and her love interest Levi are nerds but most importantly they’re kind. It is simply pleasant to read about decently well-intentioned people trying to figure things out but occasionally screwing up. Their romance is wonderful. It builds slowly—I’m talking Victorian style courtship—but because of its pace, everything between them feels earned. When the culminating moments arrive (and there are more than a few culminating moments; that’s the benefit of taking things slow—everything new, even the slightest touch, is a culmination), I was ecstatic. Like I’m-grinning-so-hugely-right-now-I-probably-look-deranged-ecstatic. In truth, I am not the type to gush or squee or deem something adorable. But here I am: gushing and squeeing over this positively adorable book.